Thanks for the schedule! I feel so overwhelmed when it comes to cleaning. This breaks it down into do-able chunks. That is a great way to keep the cleaning in small, bite sized portions 🙂 And free up more of my weekends! 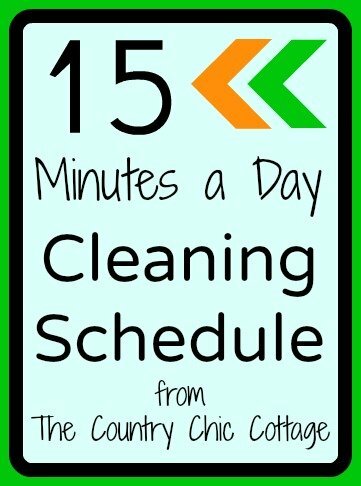 I love this idea of cleaning just 15 minutes a day… makes it not feel as daunting! Love your schedule (and the image that you used… I sometimes feel like that lady – is it Cinderella?) – 15 minutes a day can make a huge difference, especially if you’re doing something a little different each day! Obviously this person doesnt have kids! Maybe I can use this when they are out of the house. I agree! No way I could sweep and mop and do the other suggested tasks in 15 minutes! I can handle 15 minutes a day….LOVE this! You’re on the right track. You would save more time if you did like chores together. If you’re dusting, dust all the way through. The only thing that really takes longer is floors, but its easier to do it all the way through than dragging out vacuums and mops every day. My cleaning system is over 5 days. I don’t clean on weekends.